This modified MK8 Extruder has a filament guide tube, all screws, spare drive gear, and upgraded Bowden tube fitting, for CR 10 3D Printer. Our design gives complete support of flexibles from the intake and output ends. We've reduced the price and complexity of printing flexibles. It will also allow to print faster with sustained quality and no risk for grinding the filament. Frankly, it looks amazing, and performs better than the plastic version included in stock printers. It allows you to print flexibles, and regular plastic filaments. Also included is an upgraded bowden tube fitting, which does not slip, as the stock one can. Every screw and washer we would recommend for this installation is included. 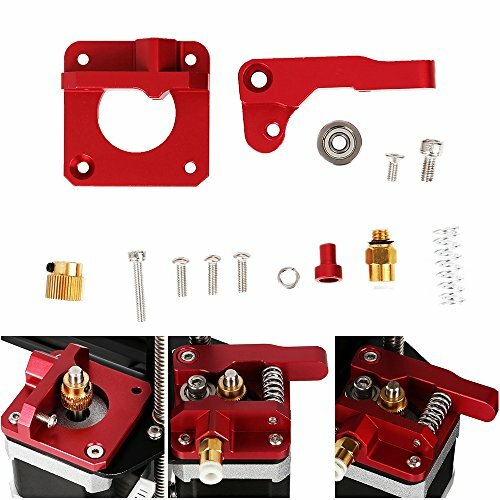 ● This extruder set is great for Creality 3D CR-10. ● Made of high quality metal material. ● Easy and convenient to use. ● With high quality and durable performance. ● 100% brand new and in good condition. ● Color: As pictures show. UPGRADE: Original MK8 extruder aluminum for Creality 3D Printers CR-10 Series, CR-10 S4, CR-10 S5, CR-10 Mini, CR-10S, CR-10 Plus. Upgrade your Creality 3D Printer Extruder with our New "Metal Anodised Aluminum" Upgrade Kit. STABLE and DURABLE: Full metal aluminum alloy, DIY kit and you need to assemble by yourself. Our MK8 extruder hotend include all the necessary screws & parts needed to directly replace your old original weak Creality plastic extruder. EASY TO INSTALL: All you do is unbolt the old original Creality plastic extruder & screw in the new "Metal Extruder" and ready to start printing. Used for 1.75mm filament of 3D printer MK8 bowden extruder frame. ADVANTAGES: The advantages of our extruder drive is you have better stronger pressure pushing the filament into the printer nozzle and so will improve on the printers' performance. Our extruder kits have an adjustable bolt so that you can adjust the pressure of the extruder gear as needed. Trusted Vendor: CHPOWER is a TRUSTED VENDOR, we provide LIFETIME manufacturer warranty on all parts. Buy with confidence. If you have any questions about this product by CHPOWER, contact us by completing and submitting the form below. If you are looking for a specif part number, please include it with your message.